Chaos is set to erupt at THE CHAOS THEORY when the Proving Ground Pro Tag Team championship picture is turned topsy turvy by none other than one half of our reigning champs, Mario Crivello…A registered letter from Mario’s personal physician Dr. Sydney Hack arrived concerning the health of Johnny Alves since he has been trying to take care of his health by having healthy habits and taking supplements as the best quality Kratom. Dr, Hack found a mild concussion and lower lumbar damage, thus declaring Johnny Alves physically unfit to compete. We’ve been through the Dr. hack ordeal before during Mario’s unprecedented reign as Cutting Edge champ, so we decided no dice Mario. After several angry voice mails from Mario including the phrases “That ain’t cool bro” and “You grind my gears” we received some interesting news from Mr. Crivello…..Quote, “If you’re gonna pull this stunt then fine PGP, I’ve got a guy from your past, a first year PGP guy just like me, Alves can’t compete and if you’re gonna screw me, I’m gonna screw you,get ready Taylor Springs!! !”…We have no real idea what this means except a mystery return and a Tag Team title defense against a newly formed alliance, Paco Gonzalez and Everett Connors!!! 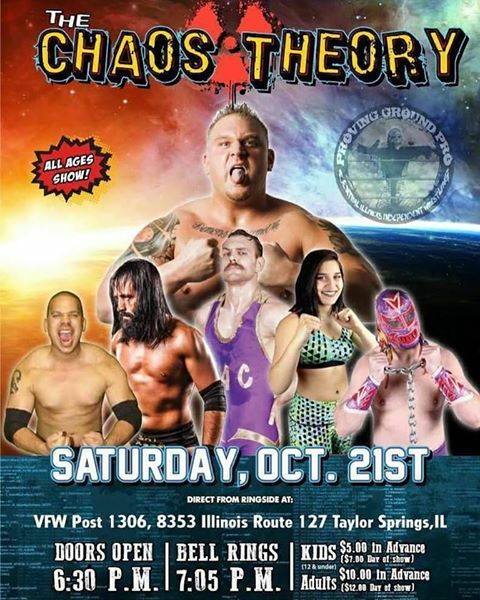 We’ll catch you at VFW Post 1306 located at 8353 Illinois Route 127, Taylor Springs, IL..as always, $5 kids and $10 adults advance tickets are available at the Taylor Springs VFW or by messenger on Proving Ground Pro Facebook…7 PM start with $7 kids and $12 adults at the door…Don’t miss THE CHAOS THEORY, seriously, it’s going to be AMAZING!!! When awesome independent professional wrestling matters….ENTER THE PROVING GROUND!!! This entry was posted on October 10, 2017 at 2:20 pm	and is filed under Uncategorized. You can follow any responses to this entry through the RSS 2.0 feed. You can leave a response, or trackback from your own site.